I suffered two years of upper back pain, brought on primarily by (a) stress, (b) carrying a child, and (c) sitting hunched over a computer. There wasn’t not a lot I could do about a and b, but c could be fixed. It has been. I enjoy the standing more than I expected. I do not get tired. My back has never been better, though weaknesses with my home desk option do bother it a little. Crucially, I discovered a trick for ensuring my feet never hurt (see below). Below the fold: My experience with high-end desks (for the office) and cheaper options (for home). First, in 2012 I looked at several options. Helpful were review articles from WireCutter, Business Week, and StandingDeskReviews. I also tried out the desks of colleagues: Suresh Naidu’s Steelcase ($1500 range), and John Huber’s Anthro Elevate. The Anthro was my favorite, but easily the most expensive ($3000 range). Most of the sit/stand options are high-end, in the $1000-$3000 range. When I first bought my desk, I thought this sit-stand capability was crucial. I liked to sit about 10-20% of the time at first. After a year, though, I very seldom feel like sitting, and can spend hours at the desk. Of course, the days that I’m tired or sick, or have just come back from a run, I love the sitting function. My 50-year old self may also like it more than my current 39-year old self. My recommendation: If you can afford it, an expensive sit/stand is as wise an investment as a good bed. You spend most of your waking hours at one or the other. 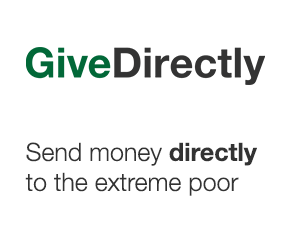 If you can’t, there are still good options for <$300 or even <$100. I return to these below. For my office, in the end I got the Anthro. To be honest, this is partly because I have serious back problems and so the University disability office offered to pay. I have never spent more than $3000 on something that does not have wheels and an engine. But it is simply fantastic, and I have zero complaints. My back has never been better. Looking back, however, even if disability hadn’t offered to pay, the Anthro would have been money well spent. And I am someone who doesn’t have a single piece of furniture remotely that expensive in my home. For home, though, I was more budget conscious, in part because I don’t spend as much time at my home office. I also did not want to have to throw out my current desk. I looked around and, again following John Huber, opted for Ergo Desktop’s Kangaroo for the iMac ($300-600). It comes highly recommended at all the review sites. The Kangaroo sits atop your existing desk and smoothly goes up and down from sitting to standing position. It can be slid out of the way, to the side of the desk, fairly easily. It mounts a very heavy monitor without issue. I live with the Kangaroo, but I don’t like it. I am six feet tall–not an unusual height–but I can’t quite get it up to the arm and monitor height I need. Thus my back troubles me a little. The Kangaroo is also jiggly, even with the stabilization arm. And you cannot lean on it, which I find helpful from time to time if spending hours at the desk. In retrospect, I would probably have bought this <$300 Safco standing-only desk or something similar. I may still, and so please let me know if you’ve found a good option. I’d prefer more desk space. Basically, this folds down to the size of a large-ish laptop, and sets up in 3 or 4 minutes on the back of most doors. It can also be nailed into a wall for more permanent use. I bring it on every trip. Unfortunately, most of the time I am facing a door, but occasionally I have been able to set it up facing a vista. In the picture I’m look out over the Black Mountains in NC. Highly, highly recommended for traveller. Finally, for the truly budget conscious, there are many <$100 do-it-yourself options that won’t have the sit/stand capability. See here. I did this for a few weeks before making the big purchase and it was an improvement over sitting. The essential accessory is an anti-fatigue mat to stand on. I cannot stress enough what a difference a mat makes. Before buying it, my feet hurt after standing for a few hours, and I would feel exhausted. The anti-fatigue mat lives up to its name. I highly recommend visiting a showroom (if you live in a big city) or looking for colleagues with one to try. I did not test out John’s Kangaroo before emulating him, and this might have given me pause. 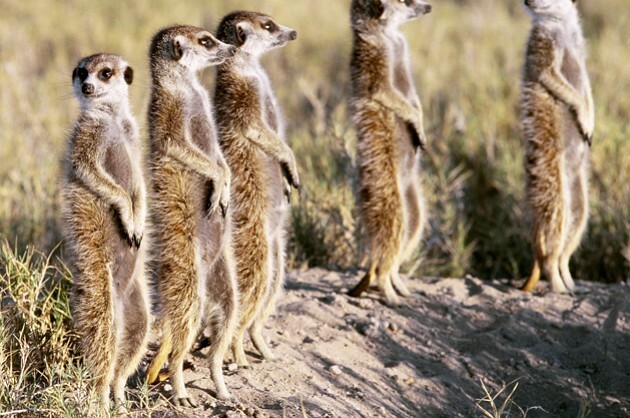 Your monitor must be at eye-level (this is true of sitting or standing). You will either need a monitor arm or a stand. If you have an iMac, or a huge heavy monitor, be sure to get the heaviest-duty monitor arm you can, one that (most of all) secures well. Not by clamp. I ended up having to drill mine into the Anthro desk, and even then I am not entirely satisfied. Standing desk user? Please add your experiences below. Questions also welcomed. The height issue on the Kangaroo: partly solved. I spoke to Ergo Desktop, and they design their models for a 30″ desk. 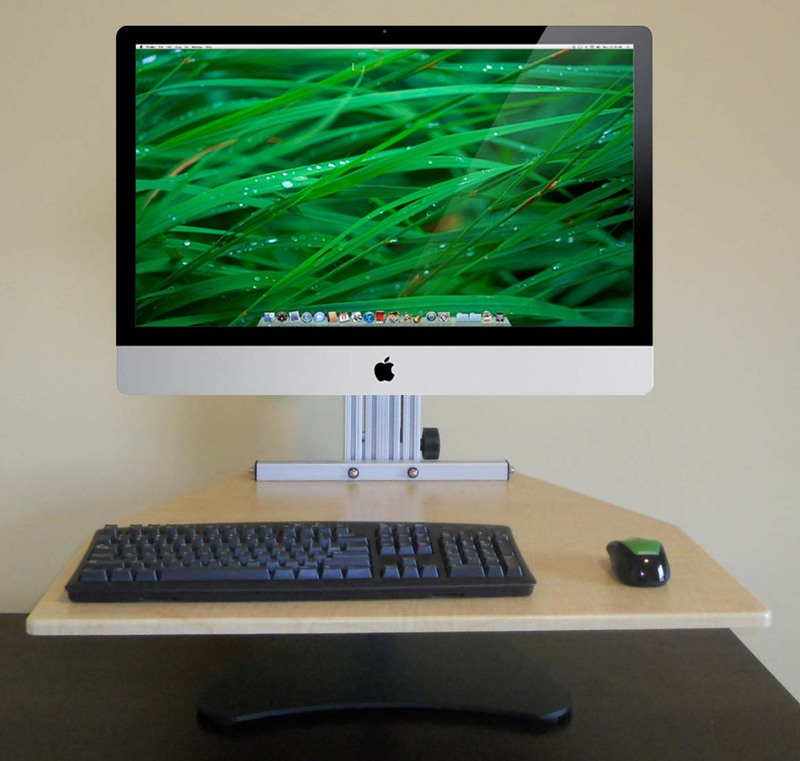 The keyboard surface is then supposed to raise up to 15″ above the desk surface, for a maximum height of 45″. I find the maximum stable height is about 14 to 14.5″ above the desk, however. In theory, this (just barely) gets me the recommended height for a 6′ tall person: 44″. Unfortunately, my desk is 29″ high and I use a mat which adds 1/2″ or so. So I am about an inch below my preferred height. This might be one reason why the Kangaroo troubles my back but the Anthro does not. If you think you want to lean on your desk (I do) or you are taller than 5’11, this may not be the desk for you. I still don’t like the jiggly-ness and wish I had taken advantage of the free 30-day return policy (where I figure out and pay for shipping). They also have a decent desk selection tool, and a pretty good blog. Several readers have recommended that a cheaper standing-only desk works well with a tall chair at hand for those times you want to sit. This sounds like a good compromise, though perhaps not for people like me who need just the right back support and height for their back. Finally, several people asked for more details about the Anthro versus the Steelcase. One thing I like about the Anthro elevate is that it is big and has two levels, giving me more desk space. I’m not sure if this is worth the extra cost. Anthro apparently have a $1200 option (they link to this in comments) and that may be worth checking out. I added the ninja desk above. The only thing I’d add to your experiences is that you don’t need a low desk to be able to sit down. There are plenty of stools and drafting chairs that are tall enough for you to be able to sit down at your standing desk when you need a break. I’ve been using this desk exclusively for a couple of months now, and I find that I sit about 25-30% of the time on the stool I have next to it. I’ve been using a standing up desk for almost two years, and wouldn’t consider going back to the other way. You are 100% correct on the need for an anti-fatigue mat. They’re not rock-solid stable as some of the others (like the Steelcase), but for home that may not matter as much, given the price difference. And they’re motorized if you want to take them up and down. I have one too – since I have a home office, I like the freedom it gives me to do workouts (or, um, dance along to work music) while I work. I initially set mine up because I couldn’t carry my desk up out of basement storage by myself, so I plunked my computer down on top of a my dresser, which was of a convenient size and height. Although the monitor is not quite at eye-level, my DIY standing desk works perfectly for now. It slides up and down very easily, so I can take 10 min sit breaks when I get tired of standing. Only complaint is that my mounted monitors wobble ever so slightly as I type. A good option if you want to be able to sit sometimes (and you will) but don’t have a sitting desk nearby or an adjustable desk, is simply to get a barstool-height chair. I have been using GeekDesk for about a year now… It is simple compared to Anthro but costs 1/3 the price. The model I have is rated up to maybe 350 lbs so you can pile stuff on top of it. 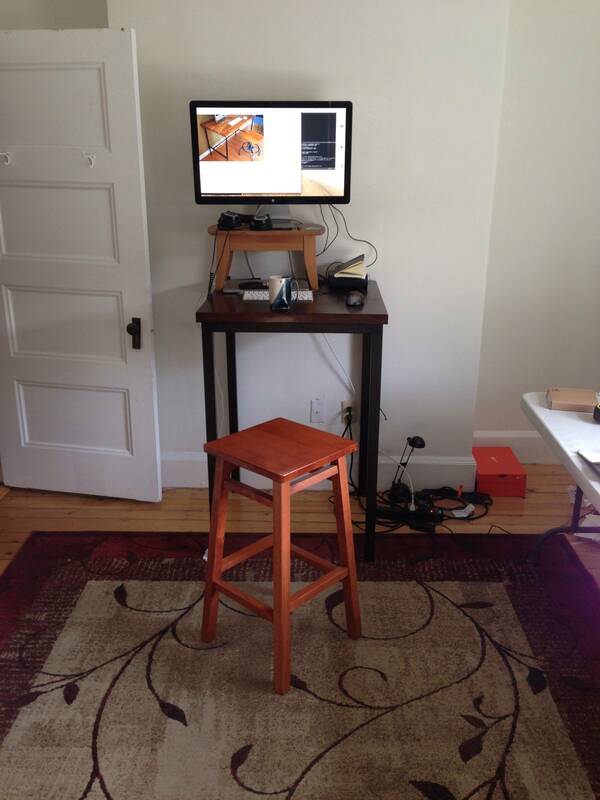 @cblatts Really liked the article on Standing Desks! Anthro also has a new sit/stand desk too- the Elevate 2- and it is priced at about $ 1,200 k so is more affordable and looks really sharp! Which mat are you using Chris? The link above is broken. Regardless, thanks for all the helpful info! Great article! I too suffered from lower back pain that came as a result of sitting all day. I’m fairly active away from work and sitting all day for hours on end behind a desk made it feel like I was taking one step forward and two steps back in my workouts. I found myself one day at The Human Solution showroom in Austin, TX where I saw a treadmill desk for the first time. I thought what most people think when they see it – how can you walk while you work? I gave it a go and was immediately sold. I ordered my treadmill desk here http://www.thehumansolution.com/treadmill-desks.html and as soon as I started using it, I felt more energetic at work. The walking/typing part is surprisingly easy. I walk at 2 mph but many other treadmill desk users walk slower than that to avoid the bumping around. The Uplift 900 is a great desk! I’ve used standing desks in the past and they were very unstable which made working at them somewhat uncomfortable. This one was easy to put together and feels very durable typing while standing (or walking in my case). It has preset buttons so you can immediately position it to the exact height you need. Thanks again for the great post and for raising awareness about something so many desk workers suffer from every day! Chris, I am glad the ninja worked out for you. The anti-fatigue mat is an excellent addition. It will add weight to the carry-one, but I will have to try it. My luggage will look increasingly bizarre as customs wonders just what I am doing in rural Kenya and Ethiopia with all of these straps and mats. Thanks for the update. I wanted to do a little quick share for anyone who works at a desk for an extended period of time. The company that I work for (Anthro) manufactures sit/stand desks here in Oregon. We have a contest going on right now and it goes through tomorrow Oct. 31st. You have the chance to win an Elevate II desk from us (we are giving away 2) if you enter. Take a look at our Facebook page and enter if you want! Hey thanks for posting the information on the Ninja Traveling Desk. I have a business trip coming up and didn’t know how I was going to deal with sitting down for 8 hours! Standing desks are brilliant and it’s all about finding the right balance between standing and sitting. I used http://www.deskimatic.com when I was looking for information. IT was useful! I was smiling when I read about stress and carrying a child, I can relate much! I had slipped disc on my C5/C6 last September. Doctor advised me to move a lot especially when I work in front of my computer; change positions as much as I can like sitting to standing. Thus, I am using the TaskMate EZ 6400 (too kind and considerate of my company for providing me with this). It really helped me a lot – work wise and much more for my health. Yes, it is true when your office chair or desk is not comfortable with your body and created back pain, such type of back pain is created when your chairs are not suited to your body and also visit your link it is so good. Thanks to you for sharing this article. Yeah, here this is great info about standing desk, because the standing desk is more comfortable and manually adjustable by user. Thanks to for sharing this article. These guidelines in this info graphic are really great- thanks! I am actually going to use an air compressor I recently bought, and these tips will be great for me so that I don’t accidentally break the thing. I recently switched to a vari-desk at work (work supplied it with a doctor’s note) after seeing several of my colleagues with them. I thought that it would help with my lower back pain, which is certainly does. 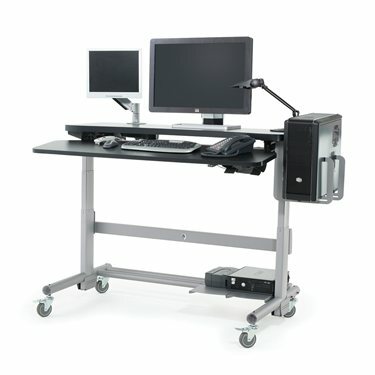 I use a timer from vari-desk installed on my computer, and I alternate between sitting for 20 minutes and standing for 10. Eventually I would like to work my way up to 15 minutes of each. It’s nice to think that I could be adding years to my life and preventing certain health problems. The thing that really surprised me though was how it changed my energy levels. I’ve given up afternoon coffee, which used to be entirely necessary during the workday, and I feel more energized and focused all day. I also feel more energized out of the workplace, in the evenings and weekends. Standing for a few hours at a party or concert is no longer difficult. I wear sneakers with my custom orthodics. I got a padded mat as recommended, but I find I don’t like it, the sneakers with office carpet is comfortable, with the mat it’s too soft. I find simply standing does make my lower back ache a little, forward bends periodically are a must to offset the standing. The most comfortable thing to do is alternate between jogging in place, walking in place, and occasionally moving my feet from side to side, or dancing slightly to my music. I was a little worried when I got it that it might be awkward being the only one using it or that my coworkers might tease me, but other than a couple of initial positive comments, nobody seems to take any notice. Hi you have great idea for mounting the monitor arms. 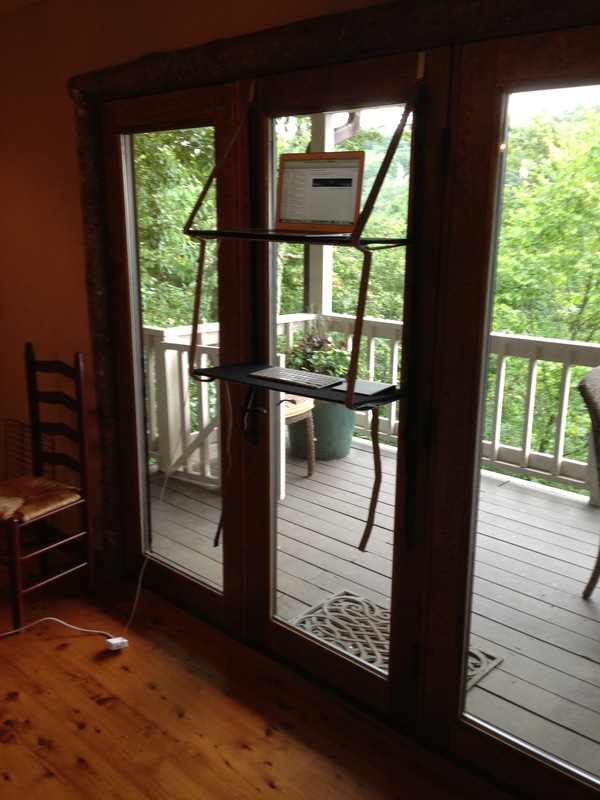 Also you have classy standing desk. Thanks for sharing this amazing idea with us. 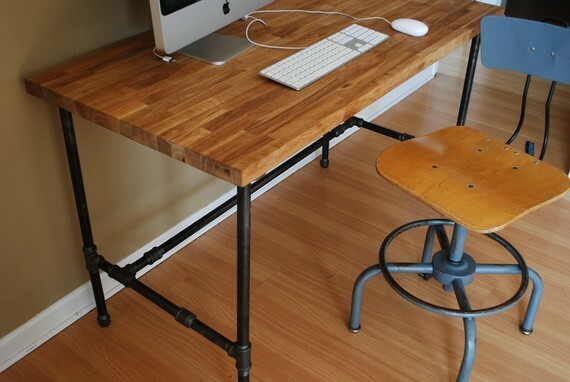 Great idea… Gonna get the desk soon. Great blog!! Excellent information – only wish I had read something like this 20 years ago. I recently switched to a stand-up desk and experienced all the transition challenges covered above. It is a radical change to an office workers daily routine and needs to be treated as such. If I could contribute one piece of advice it would be related to the area of supporting ones feet throughout the transition. The anti-fatigue mat is the best idea for your desk area. To get the same benefit but with the advantage of total mobility (I struggle with staying in one place for any length of time) I highly recommend a pair of Sanuk http://www.sanuk.com . I was feeling back pain for several months then my doctor advised me not to sit for long hours on a chair. So Last month I switched to height adjustable desk for my office work. Sit-stand desk is something that everyone should have. It is the most used ergonomic product in the office. It has many benefits like you can get rid of muscular pain from your body. It can help you increase productivity of work at your workplace. Standing desk is way better than sitting one. I have estimated my productivity has increased by 20% last month (June 2018) compared to previous month due to shifting from sitting workstation to standing one. This is not just because of physical comfort but psychological phenomenon e.g. changing position, free movement etc. also played important role.